Embedded analytics is the integration of data analytics or business intelligence (BI) software modules into another software application. Different modules (also called “widgets”) offer different functionality. For instance, one module could display data to make it easier to visualize. Another one could automatically pick out trends in the data. BI and analytics can thus be added to better understand and act on the data in an application. The right embedding can make the extra functionality look like a natural part of that application. For example, suppose you have made an accounting program for your business. Within this application, you might want a quick and easy way to see all the past financial results. Or perhaps you want to find the best solution to minimize company tax in the future. If your application does not offer these features directly, you might add them by embedding the right analytics modules. Software application vendors can also embed analytics into their products to add value. In another embedded analytics example, a vendor providing a hotel management application for hotel chains could offer BI functionality to the chain overall and to the individual hotels. Globally and locally, insights from customer data could then be used to improve hotel service and occupancy. 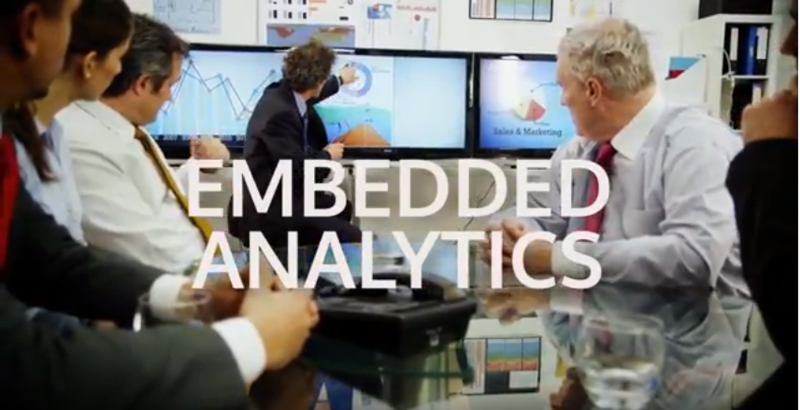 Embedded BI can make life easier for users of the application. They can get insights directly from their data without needing to switch to another application. This saves time and effort. It also avoids the need for users to buy another application, or learn a new user interface. Analytics modules can be developed by your own company or provided by a vendor. For embedding analytics in modern applications, it may make more sense to buy or license modules from a company that specializes in this area. Software developers can then continue to focus on what they are good at (like making the best accounting program), rather than trying to do everything themselves. Autonomy - Can the BI or analytics module be embedded “as is” in your application? Or will it need additional tools or code to function properly? Scalability - How many user requests can the module handle at the same time? Will it keep pace with increasing volumes of data and server power? Time to market - How long will it take to make the BI or analytics module available to users? Normally, this should be faster than if you developed the module in-house. Flexibility - What are the options for accessing the module from another program (via an API) or creating plugins to use the module’s functionality? Can you customize its output or appearance? Security - How does the BI or analytics module make sure users see just the data they are authorized to see, and no more? How well does BI security extend to a multi-tenant environment and role-based security? Overall, embedded analytics can make BI and analytics capabilities available to SMBs as well as to larger companies. It also enables software and service providers to add value and develop new opportunities for revenue and customer service.